My apologies for the poor picture. Today is a gray, drizzly day so the lighting is poor, and I can't access my fav program for editing. It was Ken's birthday yesterday and we went out to see Brave. I highly recommend it. What a great movie. Totally reminded me of Scotland and my grandparents....I really miss them and Scotland. I love washi tapes and Paper Smooches and Brave too! Your card is really adorable! I'm smiling because this is so cute! Thanks for having some fun with us at CAS-ual Fridays! Cute, cute, cute!! 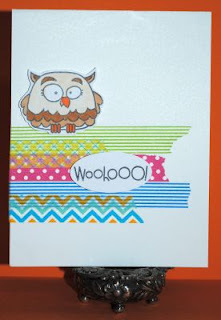 Love those stamps and your fun tape strips are so happy! Thanks for playing along with us at CAS-ual Fridays this week! I love how the Washi tape enhance this design! Darling card!Thanks for playing with us at CAS-ual Fridays! Love the overlapping strips of washi tape in such fun colors! How clever to perch the owl right on top, too. Thanks for sharing this with us at CAS-ual Fridays! That's really cute! I am so into owls right now!